"Please don't make me go through you." 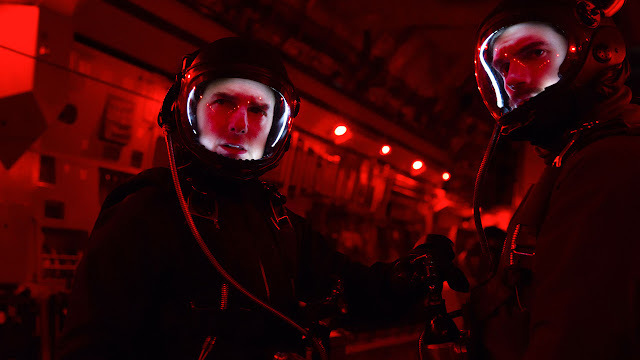 Ethan Hunt will figure it out and Tom Cruise (now age fifty-six) somehow never runs out of energy after five previous Mission: Impossible entries. Rogue Nation writer/director Christopher McQuarrie returns—bucking a filmmaker handoff tradition of each being helmed by a different auteur—to execute one of the most insane and stunning action movies ever put to screen in the franchise ender spectacle. Picking up from the last one, Fallout is the clearest direct sequel binding the disparate film series together in s rather dramatic fashion. It really tries to fully pay off the Ethan Hunt character's entire arc over now six films in a satisfying way. New to things, Henry Cavill as Hunt's forced upon sidekick CIA antagonist August Walker revels in showing his physical and acting range to provide a great foil to Cruise's absurd antics. The two perfectly complement each other's hard-driving but totally opposing efforts culminating in an intense showdown between the roguish Impossible Missions Force (IMF) and CIA to once again avert nuclear disaster. For the sixth time, the (slimmed down) team is back around Hunt. Rebecca Ferguson's Ilsa Faust shows up again in a further complex role mirroring Hunt to both impede and help his mission. Favourites Simon Pegg and Ving Rhames fill out the team with comedic and dramatic grounding with Michelle Monaghan bringing the loose continuity together. Alec Baldwin gets more to do as the newly minted IMF Secretary sparring against his CIA Director counterpart Angela Bassett while Rogue Nation's big baddie Sean Harris pays off his role from the previous film. Despite the team effort, Cruise gets to really let loose as he runs all over London and Paris in between some truly spectacular practical stunt set pieces. Full of moral dilemmas and escalation, the basic premise quantifies the ethics of hard decisions, sacrifices, and the cost of peace. The final act is a manifesto of bravado set as a helicopter chase and battle in the most threatening sort of menace revealed in the franchise yet. Fallout's choreography and stuntwork are so viscerally appealing and memorable. How Cruise and McQuarrie string the film's action and story together are such a treat of blockbuster filmmaking. It's smart enough to engross the mind just as it is visually impressive to your eyes. It's breathless and exhilarating. See it on the biggest screen you can.